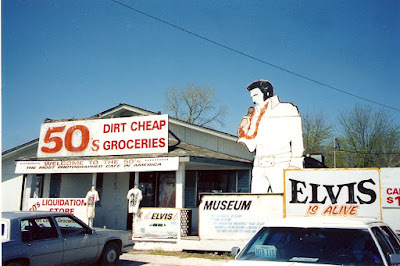 This is the Elvis is Alive Museum, west of St. Louis. Note that you can also buy dirt cheap groceries. Unfortunately, the grocery part of this museum has closed - I think it's an insurance office now. But the big Elvis sign is still there. In other news, Rove is resigning. Interesting news to say the least.